The 2018 Toyota Camry arrives in Miami fully redesigned for the new model year, and its athletic curves and confident stance are far from just a façade. Under the hood, the Camry also gets a bump in power and efficiency, while upgraded steering and suspension work help further enhance your experience behind the wheel. 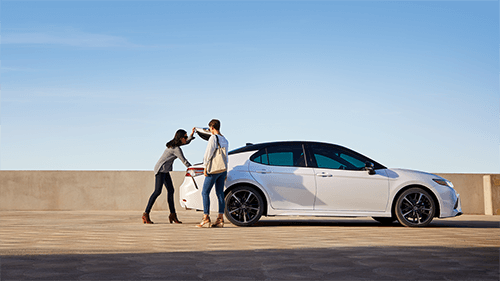 To experience the genuine thrills of the all-new Camry in person, Fort Lauderdale drivers are encouraged to make trip to Toyota of North Miami to see it up close. The base engine on the all-new Camry is a 2.5L inline-four that uses D-4S direct-injection and Variable Valve Timing with intelligence (VVT-i) to help it achieve a commanding 203 hp and 184 lb-ft of torque. Upgrade to the available 3.5L V6 engine, and you’ll get a robust total output of 301 hp and 267 lb-ft of torque, a notable increase over the outgoing model! The Camry’s new 8-speed Direct Shift automatic transmission improves acceleration off the line and delivers smooth handling at highway speeds along with increased fuel economy. In addition to the impressive powertrain numbers on the 2018 Camry, you’ll also be able to switch up your riding experience with ECO, Normal, and Sport driving modes. These impressive engine specs for the all-new 2018 Camry are only the beginning. The performance of Toyota’s midsize family sedan is also improved by a new MacPherson strut front suspension and double-wishbone rear suspension, as well as more precise steering work. And thanks to the refined engineering and design work of the 2018 Toyota Camry, the base engine is able to achieve up to 41 mpg highway and 29 mpg city! Even the available V6 engine is able to get up to 32 mpg highway and 22 mpg city. Are you ready to see what the latest version of the Camry can do on the road? If so, make the drive to our dealership near Hollywood, Toyota of North Miami. We’re located at 16600 N.W. 2nd Avenue in Miami, FL, and in addition to having rows of new Toyota Camry models for sale, we offer a variety of unique reasons to buy from us—from our Best Price Commitment to our premier service department where you can learn more about the Camry maintenance schedule. If you have questions, such as how to turn off the maintenance light, wonder how the Camry does against the competition, want to know what the Camry maintenance schedule is, or would like to schedule a test drive, get in touch with us directly!